Did you find something at a swap meet or garage sale and would like to know if you should invest in the cost of a fine art appraisal? Below are some pointers to help you make the decision. If you are just looking for places to find information and values about any antique and vintage items, scroll down to the bottom of the page for suggested links. Just put your mouse over the link name and "click." As a general rule, an original oil painting will sell for much more money than a print by the same artist. Is it under glass? If so, it is likely a watercolor, drawing, or print. You will need to check for dot patterns. While there are many types of lithographs, one of the most common is the photomechanical lithograph, introduced in the late 19th century (see illustration below). Prints usually have the artists name embedded in the print. 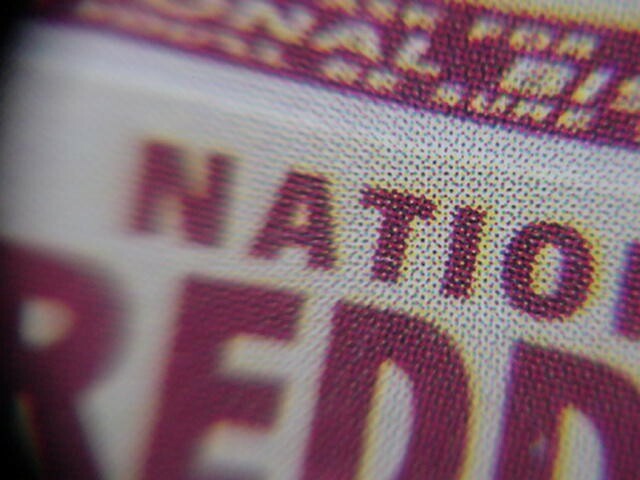 For most prints to be very valuable, it should be signed in pencil, usually in the margin at the bottom. 20th century prints should generally have an edition number (in pencil). If not, it is an "open edition" print instead of a "limited edition" print. Limited edition prints may be worth having appraised, but typically, most open edition prints are not. Open edition prints are considered to be decorative art, not fine art. There are a few exceptions. Picasso, for example, produced many open edition prints that he signed, but as mentioned earlier, the value of the work is due to the reputation of the artist. 19th century engravings (usually just solid lines, no dots) often have two names, the original painter, and the engraver who has reproduced the work. In these cases, the value of the engraving is based on the reputation of the engraver, not the original artist. U.S. currency is engraved. The result is that very fine lines can be produced with this process. Even if your art is on canvas, it still may be a print. Giclée prints are often done on canvas. Look for an edition number to help identify it as a print. Your print should be free from stains, fading, mold, and tears as condition significantly affects the value. The value of a print is severely affected by condition, partly because there is less that can be done to repair or restore damage to paper. Paintings may develop what is known as craquelure which develops as weather changes creates different rates of expansion and contraction of the paint and the canvas. While craquelure can be used to help establish the country of origin, it is generally not acceptable for contemporary paintings. It doesn't matter what someone is asking for it on ebay. The value is based on actual sales. If you use ebay, select the "sold" option in the column on the left of the page. Findartinfo.com: Free to see prices, $6.00 per day to view images. Liveauctioneers.com: Free but you will need to sign up for an account. Askart.com: $13.50 per day gives you access to prices and images. Ebay.com: If you use ebay, be sure to select the "sold" option on the left of your screen. The sites listed above along with our tips can help you make the decision about whether or not you should invest in a fine art appraisal. If you are interested in learning more about how to tell the difference between various print processes, "How to Identify Prints" by Bamber Gascoigne gives detailed information about woodcuts, engravings, etchings, lithographs, screen prints, and much more. We service the southern California (ca) area. Our primary service locations in Orange County, ca include: Orange, Anaheim, Irvine, Huntington Beach, and all surrounding cities. Our primary service locations in Los Angeles County, ca include: Los Angeles, Glendale Encino, Woodland Hills, and all surrounding cities). Our service locations in San Bernardino County, ca includes: San Bernardino, Redlands, Chino Hills, Riverside, the Inland Empire, and nearby locations in the Coachella Valley. Please feel free to call us about services in your area.